A doctor’s note for work absence is a document that is prepared by a doctor for an employee so that the employee can attach it with his application to the employer. In this note, the doctor mentions the employee’s health issue and the reason for absence from the work. It can provide confirmation about the employee’s health condition as it is coming from an authorized source i.e. a doctor. To support his application or letter to inform about the absence, it is a common practice of the employees to attach a doctor’s note with it. Many organizations, however, make its submission a requirement for the employee as well to be kept in the employee’s file. In that case, the employee must submit the doctor’s note, if he skips the work. Name of the doctor and/or hospital. Contact details of the doctor or the hospital. Date and time of visit. The reason behind the absence from work. Any health issues and overall health condition. Any other comments or information from a doctor for further reinforcement of the stated case, including required care and rest. The doctor notes can be original, fake or forged. If the employee is suffering from a health issue, the doctor would make an original note. 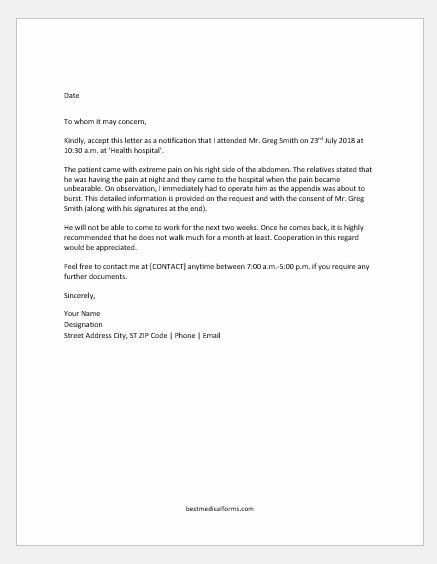 If the disease or condition is not real, but the employee just wants the doctor to support him, the note would be fake. If the employee makes a fake note himself, it would be a forged one. 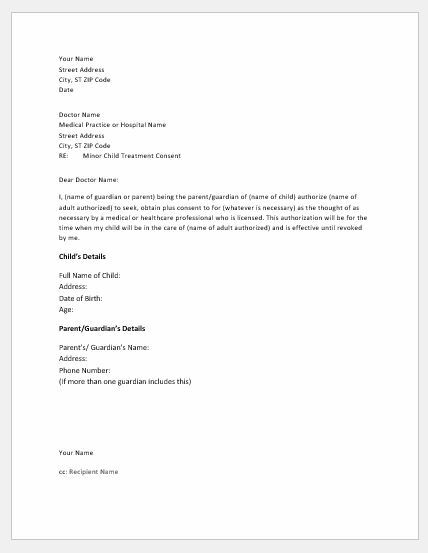 The doctor can write the doctor’s note or use an available template to customize it for his patient. The important point is that it needs to be properly written with the correct details. If there are any misleading details or loopholes, and if the employer finds them out, the consequences might even include the firing of the employee or bad reputation of the doctor. 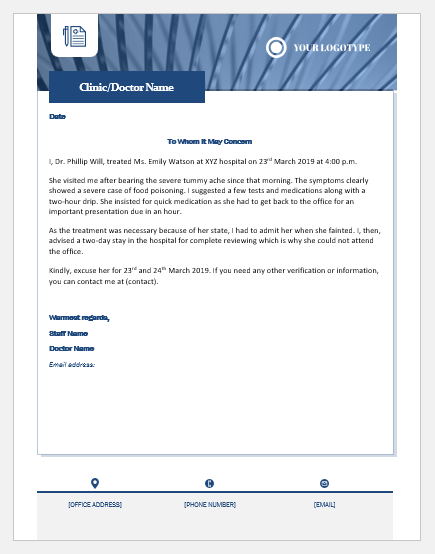 I, Dr. Phillip Will, treated Ms. Emily Watson at XYZ hospital on 23rd March 2019 at 4:00 p.m.
She visited me after bearing the severe tummy ache since that morning. The symptoms clearly showed a severe case of food poisoning. I suggested a few tests and medications along with a two-hour drip. She insisted for quick medication as she had to get back to the office for an important presentation due in an hour. As the treatment was necessary because of her state, I had to admit her when she fainted. I, then, advised a two-day stay in the hospital for complete reviewing which is why she could not attend the office. Kindly, excuse her for 23rd and 24th March 2019. If you need any other verification or information, you can contact me at (contact).